Iowa allows you to complete your divorce without an attorney if you and your spouse can come to an agreement on what to do with your property and how you will care for any children that you have. The spouse who files for divorce must have lived in Iowa for at least 365 days before filing. The divorce can be filed in the county where either spouse lives. A couple can obtain a no-fault divorce in Iowa on the grounds that there has been an irretrievable breakdown of the marriage. File a Petition for Dissolution of Marriage and related forms with the District Court Clerk in the Iowa county where either spouse lives. Your divorce is finalized when the Settlement Agreement is approved by the judge. 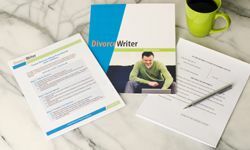 The DivorceWriter online interview allows you to complete your Iowa divorce forms quickly by just answering simple questions online. Division of property & debt, child parenting plan (including child support, visitation and custody), spousal support, and more are covered. Detailed filing instructions are included with your purchase. Forms are specific to the state of Iowa and DivorceWriter offers a money back guarantee if your documents are not accepted by the Court. If you would like to complete your divorce forms by hand, the Iowa courts website (www.iowacourts.gov) has blank divorce forms you can download at no cost. You have qualified to use DivorceWriter to complete your Iowa divorce papers online. Select "Continue" to start the interview.